Jump To: Page 1: SteelSeries Sensei 310 - Ambidextrous Eight Button Wonder Page 2: SteelSeries Sensei 310 - A Closer Look Page 3: SteelSeries Sensei 310 - Engine 3 Customization Page 4: SteelSeries Sensei 310 - The Best Ambidextrous Gaming Mouse? Starting business over a decade ago as a mousepad manufacturer, today SteelSeries competes with the likes of Razer and Logitech in the PC gaming peripheral industry, manufacturing keyboards, headsets, mice and more. SteelSeries is a sponsor of several esports teams and often touts that their products have been used to win more money in esports tournaments than any other brand. I recently had the opportunity to review the SteelSeries Rival 310, a high performance gaming mouse that truly impressed me and earned the Legit Reviews Editors’ Choice Award. The build quality, ergonomics and performance of the evolved Rival 310 were all top-notch, but it was limited to right handed use and only had six buttons. Thankfully, SteelSeries released an ambidextrous mouse alongside the Rival 310, the SteelSeries Sensei 310. 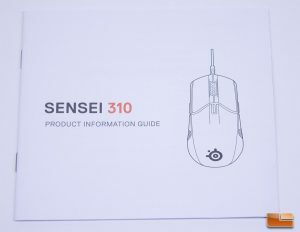 The Sensei 310($59.99 shipped) is very similar in specifications to the Rival 310 ($59.99 shipped), but has some design changes that allow it to appeal to a different audience, such as a shorter, ambidextrous shape and additional buttons side buttons. The SteelSeries Sensei 310 features the newly developed TrueMove 3 optical sensor. I covered the SteelSeries TrueMove 3 in my review of the Rival 310, but it is a Pixart PMW3360 that has been programmed with a custom firmware that disables jitter reduction in the 2100-3500 CPI range. I found the TrueMove 3 to perform well during my testing of the SteelSeries Rival 310, on par with any other top Pixart sensor. The TrueMove 3 sensor is currently exclusive to the SteelSeries Sensei 310, Rival 310 and Rival 110 series of mice, but I expect it to be used in all of SteelSeries’ future gaming mice. It is estimated that around ten percent of the people in the world are left handed, so while the market for left-handed specific computer mice is very sparse, there are several ambidextrous mice available. Ambidextrous mice feature a shape that is neither left nor right-hand specific, with both sides featuring a hand-neutral design, rather than a single indented side or other features to lend towards comfort for right handed users. My favorite mouse, the Logitech G903 LightSpeed ($106.24 shipped), is just one prime example of an ambidextrous mouse design, with equally laid out thumb indents/finger rests on each side and tactile side buttons that are able to be swapped for either right or left handed use. While I am right handed, I have grown to really like ambidextrous mice and my two current preferred mice of choice feature ambidextrous designs. 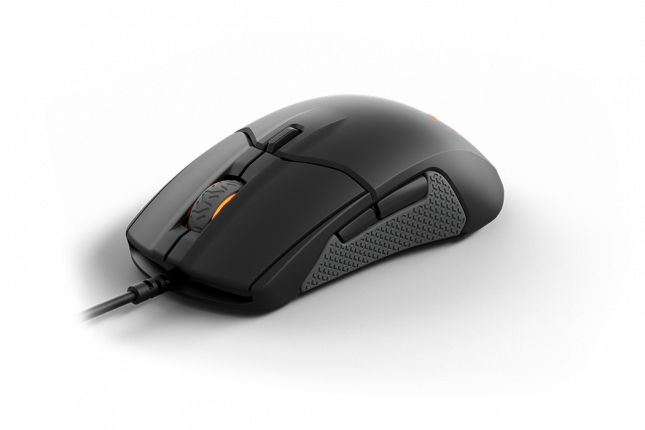 The SteelSeries Sensei 310 features thumb buttons on either side, which will make it quite versatile and open it up for some possible extended macro functionality. I’ve often found that when I test ambidextrous mice with buttons on both sides, because of where the buttons are placed in conjunction with where I like to rest my fingers, I will occasionally accidentally press the buttons on the right side of the mouse. Hopefully the Sensei 310 doesn’t suffer from the accidental press issue. 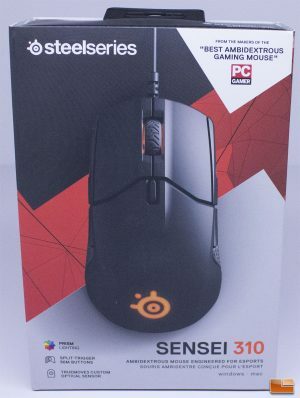 The SteelSeries Sensei 310 is covered by a one year warranty, which is less than the two years we expect to see in the face of competing companies like Corsair and Logitech. In a competitive market where you find find a variety of similar mice between various companies, it is important for companies to offer the best warranty and support for their products. 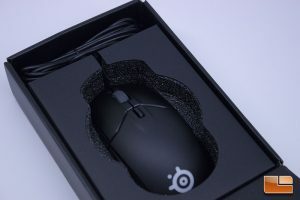 SteelSeries has packaged the Sensei 310 in a small box, with a clear, high-resolution graphic of the mouse on the front. The rear of the box has detailed information about the Sensei 310 and also references the Rival 310. On the rear of the box of the Sensei 310, SteelSeries references that esports athletes have won more money using SteelSeries products than any other brand, though I am not sure exactly what considerations SteelSeries is using when they calculate that number. 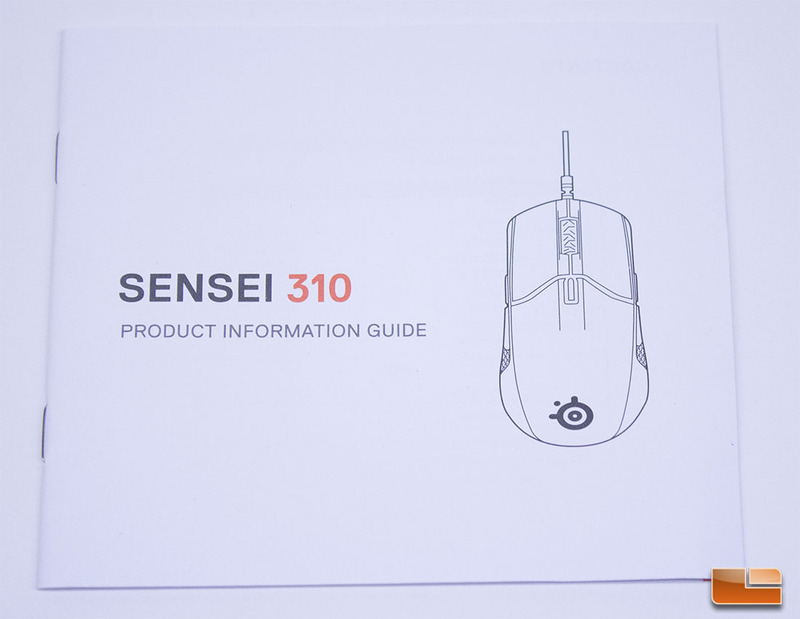 The Sensei 310 is packaged in a simple, sensible packaging, but there isn’t much to it. 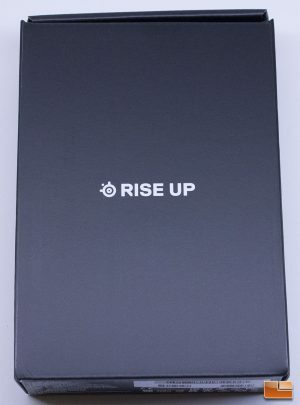 A sleeve surrounds the inner box and carries the SteelSeries “Rise Up” slogan. There is a cutout in a custom-cut foam insert that the Sensei 310 sit ins and the cable is wrapped nicely in its own section. It would be nice to see some additional protection around the mouse, but the SteelSeries Sensei 310 arrived to me unscathed. 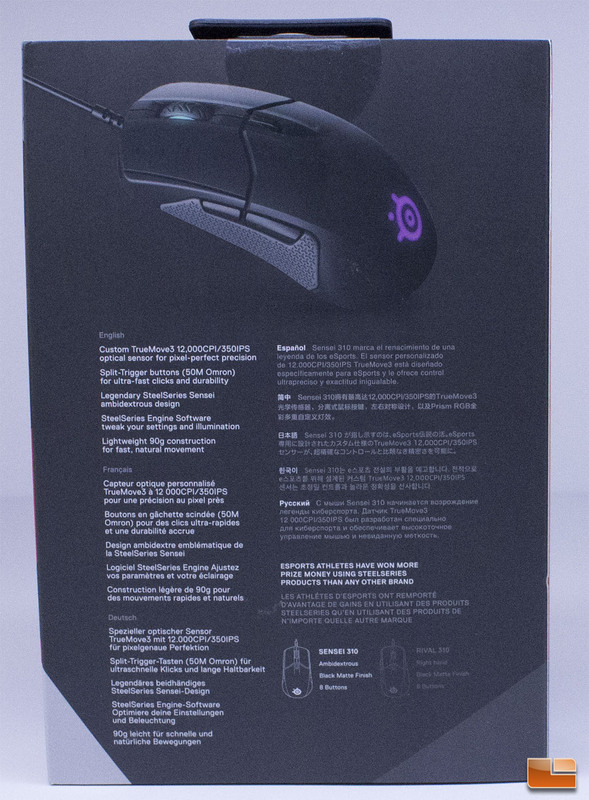 Besides the actual mouse, the only thing included in the package with the SteelSeries Sensei 310 is an owners manual. The packaging of the Sensei 310 was adequate and the mouse was presented well enough, but the lack of extras is a let down. 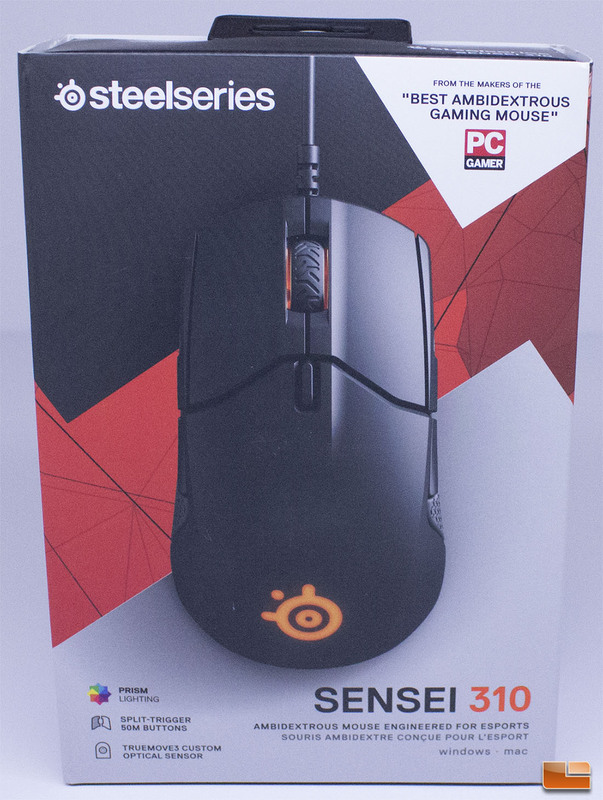 I am used to seeing stickers and other accessories with my SteelSeries products, but the Sensei 310 is packaged with a minimum amount of extras. This might not bother some people, but in the competitive arena that is PC gaming peripherals, companies should be doing all they can to add to the value of their products, even if it is something as simple as including stickers or a couple of cable wraps. 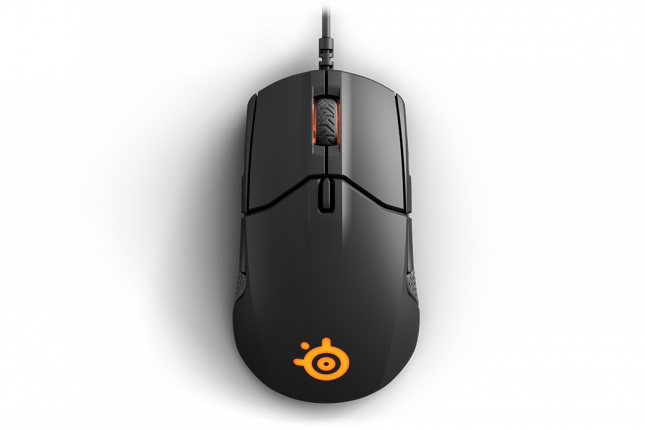 Let’s take a closer look at the SteelSeries Sensei 310, next.